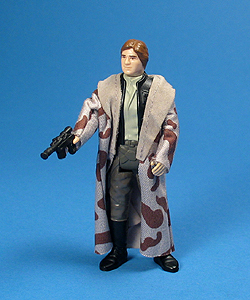 Major Variations: Though all vintage figures have minor variations, the Han Solo (In Trench Coat) action figure has two distinctly different sculpts and a few interesting Trench Coat variations. The first version, for lack of a better description, looks more like Han Solo?s goofy brother Chucky Solo. This version has a slightly smoother facial sculpt and sports an eye spray op that looks more akin to an animated Droids or Ewoks figure. The second version looks more heroic and characteristic to the character and featured the traditional vintage eye spray op. Much like the head sculpt variations, there are two versions of the body commonly found, one with sharp details and the other with softer details. The easiest way to spot these is to look at the belt that splits the pants from the shirt (not the gun belt). The less detailed version (Version 2 in the above images) sports a belt that bends down to the left of the figure after the buckle. 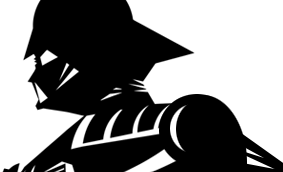 The belt on the other, sharper, version (Version 1 in the above images) on the other hand goes across horizontally without any bend whatsoever. This figure, like virtually every post The Empire Strikes Back figure features a removable head, making it impossible to say that either head sculpt was exclusive to either of the body sculpts. There is nothing to indicate that any version is any more rare than the others. There are a couple of interesting variations in the coat itself, but for the most part it is important to keep in mind that these were hand sewn, and as such were not beyond human error. The domestic version was available with both Blank and Printed Lapels. This is, however, both versions were die-cut from the same fabric as the coat themselves. The variation is the result of the sewers not consistently paying attention to what side was intended on being shown. Using Kenner photography as a guide, it would seem that the Printed Lapels was the intended version. Though, regionally speaking, one version may have been more plentiful, the Blank Lapels version tends to be the more common of the two. The Lili Ledy version of the Trench Coat was made with a flimsier fabric and tends to look frayed and a bit beat up, even sealed on the card. This version is commonly found with Printed Lapels, but since it too was sewn by hand, examples with the Blank Lapels should not be ruled out.